I saw this on my friend Brandii’s site . Looks like fun! So this is how it works: The first 3 people to leave a comment on this post will receive a handmade gift from me during this year. When and what will be a surprise. There’s a small catch… You knew there would be, didn’t you? Post this on your blog then come back and leave a comment, telling me you’re in. Fun, huh? Remember, only the first 3 comments receive a gift. Give it a try! The last week of February is upon us. Why sometimes does it seem that the shortest month of the year seems to last the longest? I honestly believe that it is because the weather is miserable and illnesses are running rampant. We have been fortunate to have a slight warm up here in Ohio, but today it is back to cold & a smattering of snow on the ground. I look forward to March and the prospect of warmer weather. I know that it can and does snow in Ohio in March, as evidenced by the 20 inches we got last year in March from 1 storm. It was UGLY and not something I wish to have repeated this year. I look at the end of February as the signal that the end of winter is near. This week also happens to be the start of Lent, Wednesday is Ash Wednesday, and that means that Easter is not too far off, 46 days to be exact. This year for Lent I will be giving up gluten. Ha ha…just kidding. LOL! No, seriously, I will be giving up wine. I remember as a child we used to give up candy or soda pop (not that we ever had these 2 items freely anyway). I don’t drink an overly abundant amount of wine, but I drink enough and I love the taste of my cabernet or pinot grigio with dinner or my dark chocolate with some good red wine. Yum, yum and more YUM!! 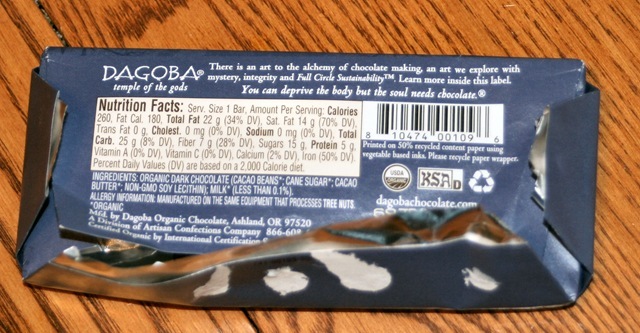 The first time I had Dagoba Chocolate was last Spring when we went to Atlanta to visit my sister & her family for Spring Break/Easter/Noah’s Baptism. Kelly (my sister), had her in-laws staying with them as well for Noah’s Baptism. Nancy, Kelly’s MIL, was kind enough to bring Jon & I some wonderful gluten-free treats. Among the treats were Pamela’s Brownies, Jennie’s Macaroons & a Dagoba chocolate bar. I remember my first bite of that chocolate bar and it was pure heaven. I believe that it was the “milk chocolate” one. I was in Whole Foods the other day looking for carob powder and I ran across the Dagoba chocolate shelves. Not only were there more than a dozen varieties to choose from, but they were on SALE! Darn sales! Who passes up chocolate on sale? Not me! LOL! 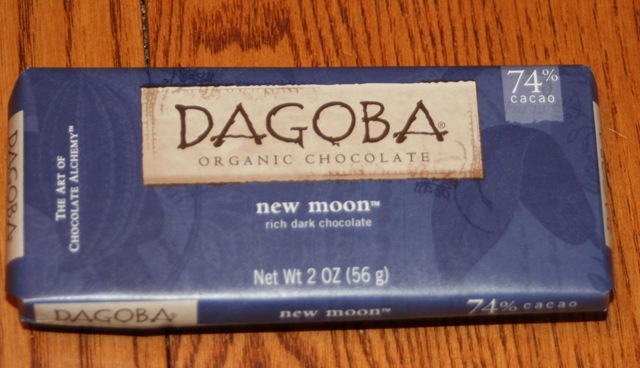 So, I bought myself a “New Moon” 74% Cacao Dark Chocolate Dagoba bar. OH.MY.GOD. Have I really gone all these years without having good chocolate? What was I thinking? Not that I don’t enjoy a good Hershey bar or Special Dark, but now I found out what I have been missing. An added bonus….according to Dagoba’s FAQ they don’t handle any products made with gluten, making cross contamination virtually impossible! Okay, we all know that I *heart* chocolate, right? 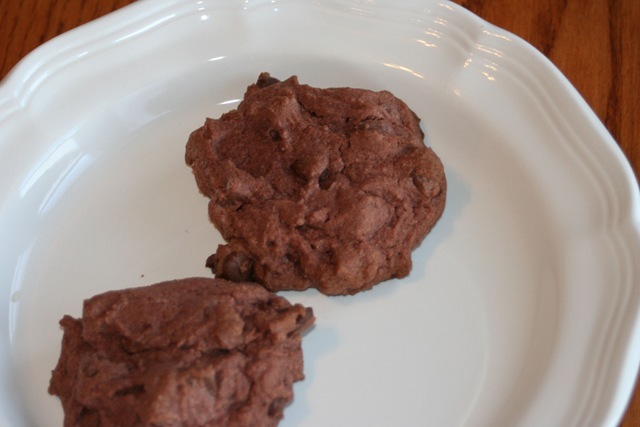 Well, when I happened upon these cookies at The Gluten-Free Homemaker’s site, I just knew that I had to make them. I modified the recipe, slightly, as I had some pre-mixed GF flour mix that was already opened and needed to be used up. Combine the flours, gum and baking soda in a small bowl. In your mixer bowl, beat the butter and sugar. Add the vanilla and pudding and beat until smooth. Add the eggs and beat again. Gradually add the flour mixture. With a spoon or spatula, stir in the chips and nuts if using. Drop by spoonfuls on an ungreased cookie sheet. Bake at 325 degrees for 9-11 minutes. The results…..A.M.A.Z.I.N.G!!!! I have never heard Jon moan & groan over how good a cookie/dessert was before. They were melt-in-your-mouth chocolatey goodness. Holy YUM!!! We then immediately started brainstorming over the other flavor combos we could make. We came up with butterscotch pudding with caramel chips; chocolate pudding with caramel chips, peanut butter pudding with peanut butter or chocolate chips, chocolate pudding with PB chips, lemon pudding with some kind of add in, though we aren’t sure what, maybe coconut? Very versatile, moist and delicious! You MUST try this recipe! Thank you, Linda, excellent recipe! Are your hands just a mess right now with the cold weather & dryness? UGH! My hands are just a mess. I feel like I am constantly washing them. I am sure that is adding to the nightmare that is in the form of cracks in the skin along my thumbs. OUCH! I try to remember to lotion up, but I literally wash my hands so much I am not sure that it helps. Not only do we have gluten in the house, with my making sandwiches out of Whole Wheat bread for my daughter, but I baby-sit a little girl and after changing her diaper or wiping her nose, etc, I am washing my hands. I am currently using Curel Targeted Therapy Hand & Cuticle Cream. It works well, when I remember to use it or don’t wash it right off. For more targeted treatment on the cracks, I have been using Aquaphor or Bacitracin and then covering with a band aid overnight. Anyone else have this issue? What do you use for hand care? All the products I use on my hands are gluten-free. I know that gluten can’t be absorbed through the skin and isn’t an issue unless you have Dermatitis Herpetiformis, but if I eat with my hands, that could be a problem. This past week was SOOOOOO nice weather wise! I mean, yes, it did rain, but I can take a little rain. I was just happy that precipitation was not in any frozen form. This week, I am afraid to look at the forecast. I know that this weather won’t last long in February in Ohio, that would just be too good to be true. So, I shall bury my head in the sand and hope for the best! I ended up deviating from my menu plan last week much more than I had hoped to. I typically do very well following it and only change 1 day per week. Last week, however, was different. A dear friend of mine passed away and her wake was Monday night, so Aaron and I asked his Mom to come stay with the kids. That meant that we didn’t end up eating until we got home later on and we just made due with what we could find. One new treat I made last week to go with the lasagna I made to surprise Aaron was Carrie’s (Ginger-Lemon Girl) Cheddar Garlic Biscuits. They were super yummy and easy to make! I will be making these again. Jon said they tasted just like the biscuits that he used to eat at Red Lobster before he had to go gluten-free. He was beyond thrilled! THANKS Carrie!! This week is going to start off with Aaron & I celebrating Valentine’s Day a day late. We do this mostly to avoid the craziness at restaurants that you see on Valentine’s Day. As you all know, eating out gluten-free is hard enough, just add in a packed restaurant and extremely busy kitchen and you have a potential disaster waiting to happen (that would be a potential digestive disaster 😉 ). Later in the week I have a dinner out planned with 2 girl friends. We are always putting off getting together because of our busy lives, but after our friend passed away last week, we realize the importance of keeping up those friendships even more. Life is too short. Keep those friendships close. Don’t put off keeping in touch. So, our new “plan” is to get together at least once a month for a lunch, dinner or just simply some coffee & catching up. Monday ~ Sweet Thai Chile Glazed Salmon, quinoa, steamed green beans & spinach salad. Tuesday ~ Bourbon Chicken, steamed brown jasmine rice & steamed broccoli. Wednesday ~ BBQ chicken breasts (Sweet Baby Ray’s sauce), baked potatoes or garlic rosemary potatoes, veggies & salad. Thursday ~ Kim out with friends; H0memade Macaroni & cheese, baked beans & veggies for the fam. Friday ~ Homemade Calzones with Chebe Mix (veggies & turkey pepperoni), steamed veggies & salad. Saturday ~ Burgers, sweet potato fries & salad. Don’t forget to check out Celiacs in the House for the weekely gluten-free menu swap. Also, Orjunkie has lots more menu plans. Aaron came home with a bunch of candy that he got at a meeting yesterday. Of course I immediately confiscated it and scrambled through it to see what was in the package that Jon and I could eat. 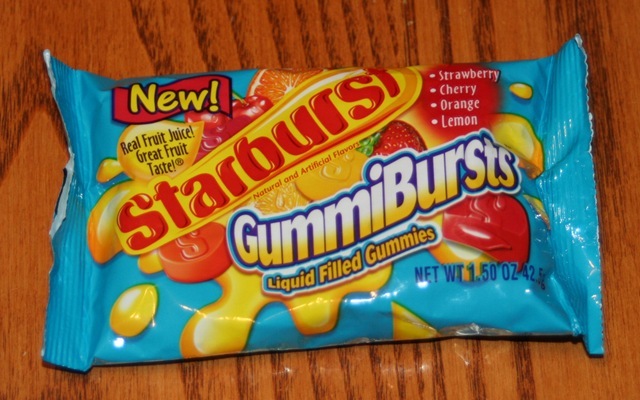 I came across Starburst Gummibursts and immediately turned them over to read the ingredients. I am almost as much of a sucker for all things gummi as I am for all things chocolate. Imagine my surprise when I get to the bottom of the ingredient list and see “Gluten-Free” staring right back at me! YAY!! 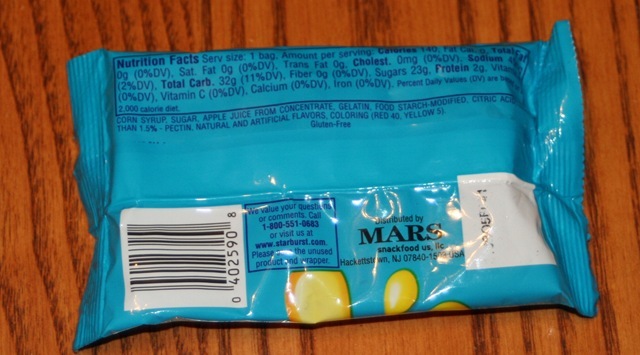 So, MARS, THANK YOU, for making life a little simpler for those of us who have to adhere to a gluten-free diet due to Celiac Disease or other dietary or health issues.